Besides the regular offer the Koblar steak, the Pohorje-omelette and in winter time home made products from slaughter are amongst the favourites. We prepare delicious lunches from Monday to Sunday from 12 am to 6 pm and we offer a great variety of tasteful meals from Monday to Friday from 10 am to 2 pm. The children can have fun and play in our beautiful playground garden next to the river while the parents can carelessly enjoy the natural environment and our offer. You and your guests will be pampered with culinary delights from Slovene and international cuisine. You will enjoy our exclusive dishes and decoration. Moreover, we can offer some advice about the appropriate selection of the whole cuisine and wine. Each year on the 30th of April for the past 20 years we have prepared one of the biggest bonfire nights with a rich entertainment program, live music, fireworks etc. It is possible to spend the night in your motor home on a special place next to the restaurant. 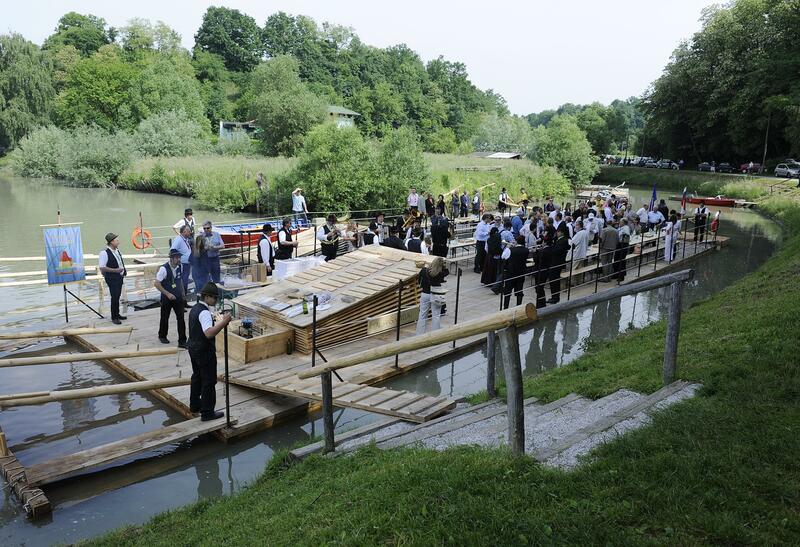 The rafts-men, the rafts miss and their attendants provide a fun and relaxed atmosphere accompanied by the typical Slovene music played by the group Splavarski trio during the raft trip. Please do not hesitate to contact us for additional information and reservations!